The Marriage License, a Norman Rockwell painting, appeared on the cover of The Saturday Evening Post published June 11, 1955. This is another timeless favorite of Rockwell collectors, a classic for the ages. This painting was Rockwell's fourth cover for The Post in 1955. In 1955, there were five Norman Rockwell Saturday Evening Post covers published. This was also Rockwell's 485th cover illustration out of 322 Rockwell painted for the Post. Rockwell's career with the Post spanned 47 years, from his first cover illustration, Boy With Baby Carriage in 1916 to his last, Portrait of John F. Kennedy, in 1963. The original oil on canvas painting, 45.5 x 42.5 inches or 115.5 x 108 cm, is currently part of the collection of the Norman Rockwell Museum of Stockbridge Massachusetts. on page 206 of Norman Rockwell, A Definitive Catalogue by Laurie Norton Moffatt. A photograph used in painting this illustration is reproduced in Norman Rockwell: Behind the Camera by Ron Schick on page 191, as well as the painting itself. 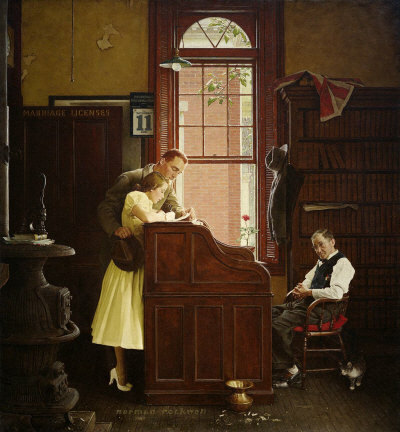 This classic Norman Rockwell painting shows a young couple applying for a marriage license. This is one of Rockwell's most recognizable images and with good reason. The sign on the open door, "Marriage Licenses," starts the telling of this story. The three human characters in the painting are the young man and woman getting married and the clerk. This painting, like many of Norman Rockwell's artworks, features several contrasts. The first I notice is how bright the daylight is through the window and how much darker it is inside the office. In fact, the only feature of the painting brighter than the window is the young lady's yellow dress and shoes. The next and most obvious contrast is the young couple and the licensing clerk. Compare how attentive and intent the young couple (modeled by Francis Mahoney and Joan LaHart from Lee, Massachusetts) is concerning their application and how detached and almost bored the clerk (modeled by Jason Braman) appears. This is understandable. After all, this is old hat to the elderly clerk who has seen it all and seen it many times. Only a thorough search for the records would reveal how many marriage licenses he has issued. This same public records clerk may have been presiding when the parents of these two applied for their marriage license. Paint is peeling from the dingy walls. Cigarette butts are deposited on the dingy floor. The pot bellied stove is perhaps the clerk's only heater in the winter. The Marriage License was only one of 322 Norman Rockwell Saturday Evening Post covers; Here is the list of Norman Rockwell Saturday Evening Post cover illustrations. And yet, here is this young couple, he in a new suit, she in a new dress, coming to this ancient relic of an office applying to obtain permission from the state to start their new life together. We do not even know whether the tabby cat is the clerk's pet or a wanderer who only came in through the open door or window. Surely, though, the clerk is not completely alone. After all, he does enjoy a single flower on the geranium plant in the window. But even that plant looks sickly to me. The calendar on the wall, complimentary from the Housatonic National Bank, reinforces the publication date. It reads June 11 also. Rockwell must have been a valuable asset, indeed, to the Post to be able to plan ahead and include the publication date in his painting! It will not be long now before they can say just married. Do You Have A Great Story, Opinion Or Contribution About Marriage License?